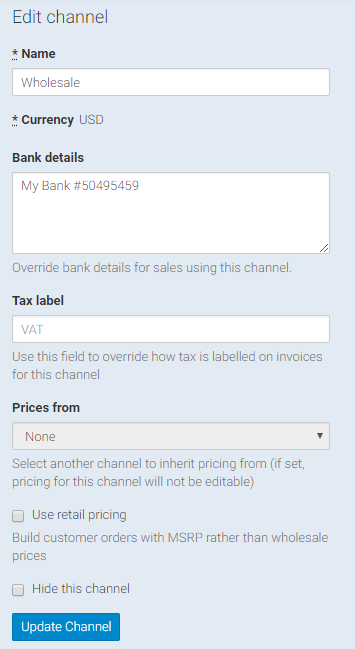 Channels allow you to set different pricing streams for your products. For example, if you sell your products mostly to wholesale customers but have some private clients, you can define two pricing structures by creating a channel for each type of sale. Later, you can segment your reports, dashboard and other areas of Stitchex by channel. Click on the plus sign in the top right corner to add a new channel and bring up the new channel form. Enter the channel name. 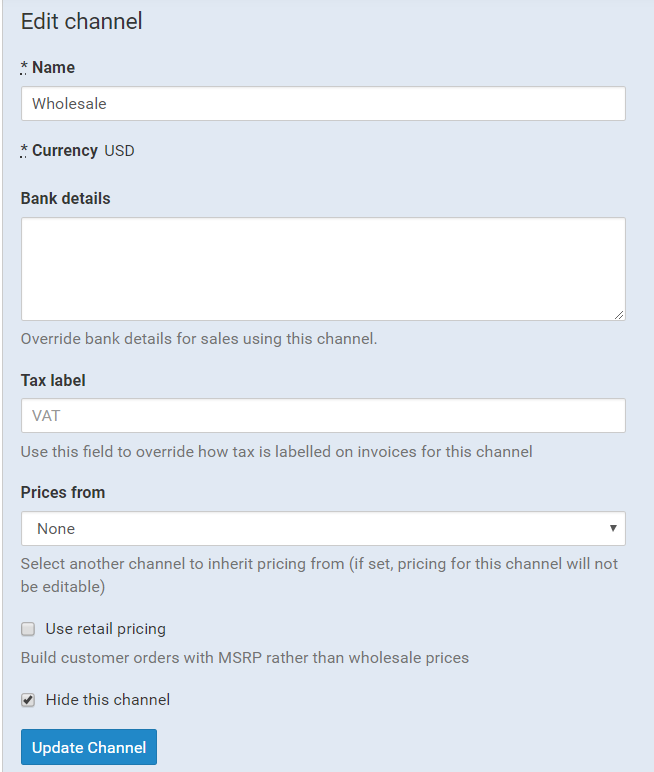 An example channel name might be "Wholesale", "Private Clients", "Online Sales". You can always change the name later. Enter the channel currency. This is the currency that all sales associated with this channel will be billed in. After creating the channel, you will be able to configure pricing for your products in this currency. Keep in mind that you cannot change a channel's currency later. You can price your products separately for each of your channels. When you edit your product's variations, you'll see fields for entering wholesale (WSP) and MSRP/RRP pricing for each channel. For each channel, the wholesale (WSP) price is the price you are charging customers. The MSRP price is used to optionally provide suggested retail pricing on certain paperwork (delivery notes, line sheets etc). If you click in the MSRP column, you actually get recommended amounts based on your total cost. For more details, see our Product Variation documentation. Click Update Channel when you are ready to save. Navigate to Settings > Channels. Click the edit icon to edit the desired channel.